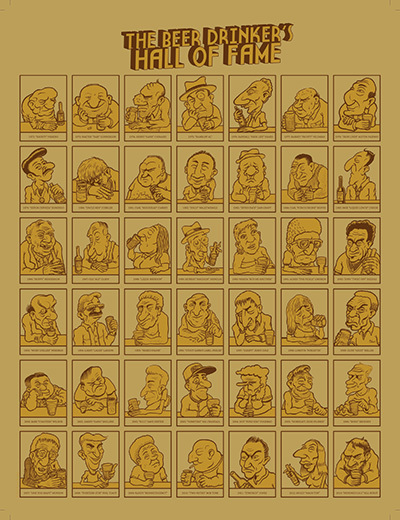 The Beer Drinker’s Hall of Fame is a limited edition poster I illustrated and designed (printed by the enormously talented folks at Burlesque of North America) for the first annual Posters and Pints show. It featured images of the last 42 honorees that would have been inducted into that noble institution, had it actually existed. The show featured 40 posters by 40 different drunken Minnesota artists, along with a number of breweries from the area sampling their wares. You can see a high-resolution image of the completed poster here. You can read more about the show at postersandpints.com.